Astrological cycles also rule the phases of Saturn. Yet no set rule exists as to how Saturn governs timing in the historical process. As Emerson said, “A foolish consistency is the hobgoblin of little minds.” Judging astrological cycles is one of the tricky logogriphs of astrological assessment. Some astrological texts have attempted to make up rules. Unfortunately, in the next crisis, or in the next major development, those rules always failed in their application. Yet in the end, or in the beginning, Saturn is always there. An astrological procedure does exist that enables the astro-historian to arrive at a deeper understanding of events that have either happened or are occurring presently. This is called phase theory. To the Sumerians, the first astrologers in history, the first light of the crescent Moon, seen a little after sunset, was the beginning of the new month. Phase theory was first employed by the ancient Sumerian astrologers. Tracking the Moon in its various stages of illumination is called lunation theory. The lunation cycle was the first phase tool to be used by astrology thousands of years ago. Simply put, the Sun and Moon and Earth have a cycle, wherein the Moon orbits about the Earth, and in the sky increases in light, and then decreases. Each configuration of the Sun, Moon and Earth has an impact on the individual and on humanity. Much has been written on the Full Moon—its stirring up of madness in asylums, the frenetic criminal activity that the police attempt to control on a Full Moon Saturday night, the spring tides and neap tides, etc. Everyone feels that something major is going on during this configuration. These configurations were first suggested to us by the Sumerians, and in the 20th century they were developed and applied to modem astrological practice by Dane Rudhyar. Astrology has taken eight of these configurations and given them names and meanings. The New Phase—0 to 45 degrees. The birth. This phase begins at the conjunction and goes to the first octile, the 45° aspect. This aspect can be between Saturn in the sky and natal Saturn, or between transiting Saturn and the natal Sun. Franklin Roosevelt. Click for larger. One of the most important times in the chart of a historical personage is when Saturn conjoins that persons’s Sun. When this conjunction occurs, two events can happen. It can mean a rise in power. 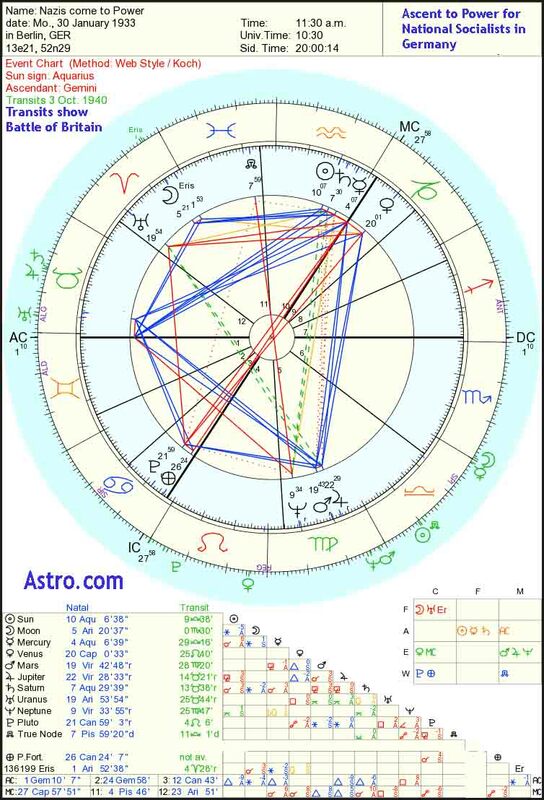 When Franklin D. Roosevelt was sworn in as President (March 3rd, 1933) Saturn was exactly conjunct his natal Sun. The day Eisenhower was elected President, in November 4th, 1952, Saturn by transit was exactly conjunct his natal Sun. Historically, this transit has to do with something new being born in the chart of that individual or nation. With Eisenhower and Roosevelt it was an ascension of power; with Vice-President Nixon, who left office the day Saturn conjoined his natal Sun, Jan. 20, 1961, it was the beginning of a new life. They were all functioning under the Sun/Saturn phase influence. In a nation’s chart, when Saturn conjuncts the Sun of that chart, one can safely say that some new structure is being born, that perhaps some old structure is dying. When Saturn was sitting right atop the U.S. Sun (1776 chart) on August 9, 1974, President Nixon resigned from office. While this event was part of a larger cycle (see the essay, Jupiter Saturn in America’s Chart), astrologically, one could assert that the executive power was undergoing a complete restructuring. Was it better for America that the power of the presidency was restructured, giving a new preponderance of power to the legislative branch? I can not make such a judgement, even more than a generation after the event, not until the prejudices of the day are finally dissolved in the multitude of years, and the essential truth of a situation becomes clear to all. Whether this new energy was beneficial to humanity or not is an extremely difficult judgment for the historian to make. It could take as long as a century to find out the truth. Opening Crescent—45 to 90 degrees. The first reality check. The new has been born, and Saturn has moved to forty-five degrees ahead of that initial position (whether a transiting Saturn to natal Saturn, or transiting Saturn to natal Sun or some other point). This placement is called the crescent phase. What was born—sometimes quietly and at other times with loud fanfare–now gets tested by saturnine reality. At the 45 degree aspect, the test can be rather severe; at 51 degrees, a need often arises to spiritualize the original impulse. One can be given a vision of the meaning of the whole thing. Many intuitions at this phase. At the 60 degree aspect, a stabilization of form can occur. This is often when the first successes are experienced by the structure that was born at the new phase. At the 72 degree aspect, called the quintile, this structure learns to function on a wider scale, more brilliantly and often in a unique manner. The crescent phase establishes in the real world whatever is being created. This mechanism often has to do with getting separated from whatever it was that helped give birth to the new structure. First Quarter—90 to 135 degrees. Structuring in the world. This configuration, commonly called the first quarter square, is the most active of all the aspects. The phrase “where angels fear to tread” applies to this phase: It is so energetic! The impulse, the new structure, has had time to grow and develop and establish itself. Now it moves out into the world and has a powerful interaction with it. In the ancient and in traditional astrology, squares have been called “malefic”. I have always felt this definition to be highly judgmental. Natally, Bill Gates has a Sun square Uranus, and it is what he used to build one of the largest computer companies in the world; Winston Churchill had an almost exact Mercury square Uranus, and supported himself his entire life by writing, even winning a Nobel for his history of World War II. Squares (and oppositions and octiles) are building blocks, and define how you create and what you contribute. Squares are not “bad”. Sometimes they show a need to integrate two differing energies. Phase squares always demand an active exercise of the powers of the structure that was born during the new phase. The first quarter demonstrates a need to move out actively into the world and meet its challenges. If something is done in the world, if a project is begun, if a new government is founded, if a new political party is started, you may always get a rough estimate of where it is going, how successful it will be, if you look at its first Saturn (to natal) square, and observe what it is doing at that time. This first quarter square of Saturn in the sky to natal Saturn occurs seven years after the initial impulse of creation, the new phase. At ninety degrees, this phase is the most dynamic; the 120° aspect is more stable and quiet, but it still has that energy. The Gibbous Phase—135 to 180 degrees. Re-adjustment. In this phase, the initial impulse, which has actively moved out into the world, is now refined, made more powerful. The gibbous begins at the trioctile (135°), where there can be a confusion of intent. The direction in which the impulse is heading can sometimes be derailed needing to be put back on track. At the biquintile (144°), the agency or group embodying the impulse can become quite ingenious in achieving its goals. At the inconjunct (150°) there can be a certain falling away, a separation from what the person or agency or organization considers useless or no longer needful. There can also be a falling back into past habit patterns, into past ways of doing things, not beneficial to the integrity of what is being done. This is when, for example, that old rejected government plan is pulled back off the shelf (perhaps by a certain subgroup within the organization or bureaucracy), and is, with all its flaws, resubmitted for approval, and accepted. Occurrences like this are common under the gibbous phase. Under the gibbous influence there occurs a readjustment as to how the energies must be applied in the world. Full—180 to 135 degrees. Flowering or reorientation. During the full phase one of two events will occur: a flowering, a blossoming of the energy that began at the new; or a disintegration of the original impulse, and a new beginning. One or the other always occurs. 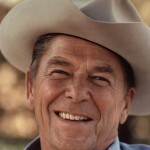 When President Ronald Reagan experienced the transit of Pluto opposing his natal Saturn in October of 1983, two significant events occurred in his administration. First, after the Iranian suicide terrorist bombing of the Marine barracks in Beirut, Lebanon (Oct. 23, 1983), in which 241 Marine and Navy personnel died, he ordered a withdrawal of American forces. Second, within the same week, in order to protect the lives of 1100 Americans living there, he sent the military into Grenada, a small Latin American country that was suffering a reign of terror. The president was experiencing an opposition of transiting Pluto to his natal Saturn. For President Reagan, this was a period when he found his stride as president, when the exercise of power became a joy instead of a burden. Many political personages, organizations and groups are destroyed when Pluto makes one of its two-year-long oppositions to a Saturn. Since the president weathered the opposition and was not destroyed by this transit, it is my judgment that he was using the awesome power of the American presidency in a karmic and just manner. Nazi Party Ascent to Power Chart. Click for larger. Examining the ascent-to-power chart of the Nazi Party (Jan. 30, 1933, Berlin, 11:30 AM), we find that when Pluto opposed the Saturn in that chart, two interesting occurrences happened. Eisenhower landed in North Africa, wiping out the armies of Rommel, capturing over 200,000 soldiers; and the army of General Pauling, capitulated at a location in Russia called Stalingrad. While it took two more years to end that war (as Pluto moved towards the opposition of the Sun of that chart), this was the time, ruled by Saturn, when everyone on both sides knew who was going to win the war. In this example, the opposition of Pluto to the ascent-to-power-Nazi-chart Saturn pointed to an outcome of disintegration. Closing Gibbous—135 to 90 degrees. Smooth functioning. I have found that when this phase is emphasized, the agency, or nation, or historical process is now in its own, is functioning as it was born to, as it was meant to, and will continue to do so all the way to the closing 45 degrees, the balsamic phase. At the 1500 aspect, the inconjunct, there will be that tendency to go off in bizarre directions; but if that historical impulse has made it to the Full phase and survived, then it will continue for many years. Battle of Waterloo. Click for larger view. Last Quarter—90 to 45 degrees. Outer vibrancy, internal withdrawal. In Rudhyarian psychology, this is a period when the personality begins to withdraw, focus its awareness on interior matters, when it seeks to create new structures in its life. I have found that when a person or nation is under a last quarter influence, they are still very much out in the world maintaining an influence in world events. This influence may be stronger than any other time in their life. 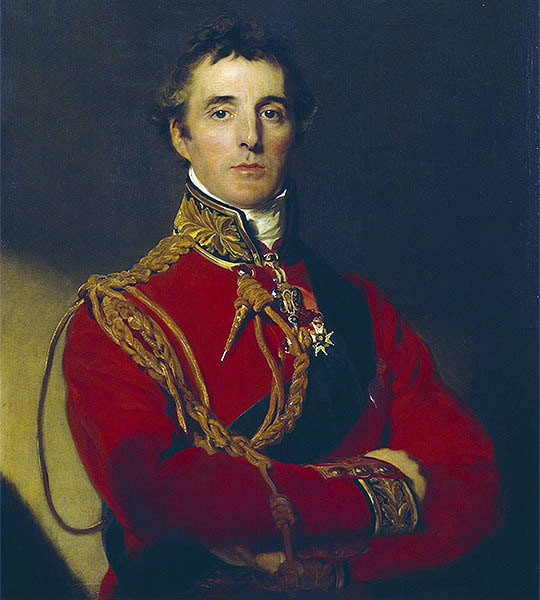 Wellington destroyed a tradition of centuries-old military aristocracy in Europe at the Battle of Waterloo, when transiting Saturn formed a partile square to his natal Sun. Was this an influence impelling him to withdraw from the world in order to recreate himself? Possibly. After that battle, he never again went to war. But this was an inner decision, one not forced on him by outside events. President Carter came to power under this configuration (in his case, with a verified and true chart, progressed Sun to progressed Moon). I can cite numerous other examples. The last quarter square is often not as active as the first quarter, possibly because whatever is under this influence does not need this activity. If change is required, or if integration of differing energies is the order of the time, that impulse may arise from the inside. Though the personage or agency may weary of their power and expertise, or may have grown corrupt, function in the world flows quite well during this phase. The Balsamic Phase—45 to 0 degrees. Dissolution. A period of withdrawal, a slow release of old structures. If the agency or personage or party or corporation is going to move into a new phase (and many often do), they may receive visions of the new but may not be able to act upon them. Much of America’s political stability is derived from a two party system. Generally, one party is liberal, while the other is conservative, one represents the common man, while the other whatever aristocracy or elite is in power at the time. When a party enters its balsamic period, it tends to lose power. Its ideas appear old and threadbare (and they usually are). The party continuously loses elections simply because people don’t believe its philosophical and political messages (and the people are usually right). What once was truth is now doctrinaire fiction. The time has come to release the old forms, the all-too-crystallized ideas that don’t apply to a present human condition any more. A new political truth must be created so that the ideas and motivating philosophy of the faction, the political party, can be reborn. One can apply phase theory to all the planets, to the Moon and the Sun, to the bright stars. When Saturn is a part of one of these configurations, a clear, definite event of historical significance often takes place. One may ask, “How is Saturn interpreted historically?” The answer is that, like sand flowing through a sieve, it will make itself of use in any manner possible. To determine the location of each grain is beyond our present abilities. An examination of the natal position of Saturn in the chart of a president, a prime minister, or a king will tell you about the nature of that administration, government, or rulership. One can examine Saturn in its relationship with the other planets—with Jupiter, or Neptune, or Uranus, or Pluto. One can examine Saturn in relationship to the natal Sun or Saturn in the chart of a leader, a nation, a group. All these examinations will instruct the astro-historian. Tracking the movement of Saturn in relation to a natal chart is the swiftest and easiest technique to gain an understanding of the meaning of the events taking place. Also, you may want to read the section on America’s Saturn Returns.